It can be the best of jobs and it can be the worst of jobs. The virtual office — the ability to work where and when you want — means that you can go anywhere. But it also means that work can follow you anywhere, too. Virtual offices provide everyone from entrepreneurs to freelancers to sales reps to office workers the chance to shed the commute, incarceration, and interruptions of life in traditional offices. But it also lets work invade all aspects of life, separate you from colleagues, and undermine your learning on the job. Like it or not, three trends are making the virtual office the office of the future for many of us. First, take the evolution of the corporate career. Or maybe extinction is a better word. Downsizing used to be something companies did when profits were down. Now, with profits at an all-time high, the trend continues. Companies are learning how to use temporary or part-time workers and consultants as a cost-effective and flexible way to respond to a fast-changing marketplace. By choice or circumstance, more of us are managing our own (virtual) offices, if not entire businesses. Second, the advances in information technology in the past five years, let alone the past two decades, has made work virtual — email, Office, conference calls, web presentations, and analysis. It is only a matter of time before the last tethers to our desks are cut. And while technology has disconnected us from the physical office, it’s also connected us to the best talent anywhere. It’s now business as usual to tap talented programmers, administrative support, designers, engineers, and manufacturers anywhere in the world. Finally, the opportunities for work and profit are moving faster and farther away every day. The days of the company town are gone with the days of the company career. And yet home ownership, dual careers , and the knowledge that each new opportunity may only last a short while keep us from moving to where the work is. As companies and technologies get better at allowing us to work from a distance, it’s up to us to figure out how to do that work well. 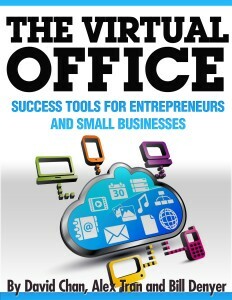 AD Publishing’s Amazon Kindle Book “The Virtual Office – Success Tools for Entrepreneurs and Small Businesses” provides you with critical tools and perspectives to make the virtual office a success — whether you’re an entrepreneur, small business, or part of the growing and global teams that large corporations now rely on. There are many benefits to the virtual office. Certainly less money spent on facilities, but also the ability to build a team with the right talent from anywhere in the world; to focus on the work and spend less time in unproductive meetings; to be measured on your work product rather than time spent at the office. At the same time, there are downsides. The loss of social connections and unexpected conversations; the added time and energy to find mentors; and the misunderstandings that come from communicating through thin mediums like email and phone calls. It can be the best of jobs and it can be the worst of jobs. It’s up to you. To make the most of going virtual, you need to learn the best practices that are out there. That’s where this book will help you. This introduction is written by Dr. Andrew Hargadon.